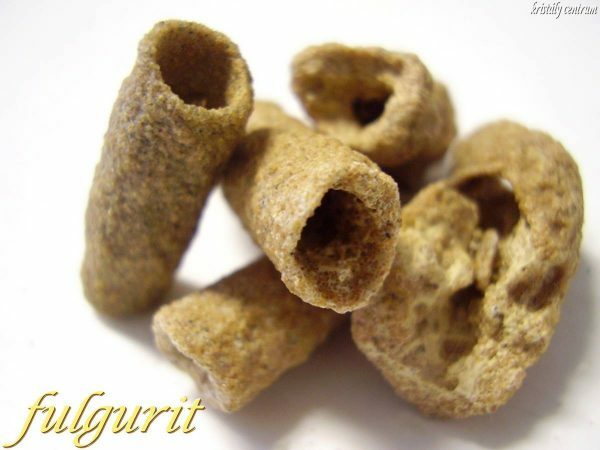 The name of fulgurite was given after the latin word ’fulgur’ (lightning), because lightning creates it when the flash impacts in sandy, loose ground, so on 1800 Celsius degrees the silica in the ground melts into glass. Usually dendriform ’small pipes’ issue, they may be rarely more meters long but very fragile. Its color depends on the consistance of the ground. Mostly its specimens which are sold, orgin from Sahara, but interesting pieces turned up in the Kalahari Desert.